My daughter says that our gracious Baltimore Shabbat hostess is like “Avraham Avinu.” I agree…The abundant food, the uplifting conversation, the welcoming atmosphere that makes me feel like I am doing my hostess a favor by being her guest and not the other way around. And like Avraham Avinu with his tent open on all four sides to welcome guests from all directions, our hostess’ front door is wide open throughout the meal. But the truth is, this makes me a bit nervous. I am the daughter of two New Yorkers, which means that the front door of our Baltimore home is locked every minute of the day. “Do you want me to close your door?” I ask our hostess. “Oh no, I like the welcoming feeling of having the door open.” And I can see why…half way through the meal a delicious 18-month-old granddaughter in turquoise sandals walks in without knocking (her mother walks in right behind her), and everyone present squeals with pleasure. Hmmmm…surprising to realize that Baltimore is so safe! What a warm, close-knit, secure community. But when I arrive home later that afternoon the Baltimore Sun front-page headline reads “A Bloody Summer” about the 29 shootings resulting in 10 deaths last week alone. Millions of disgruntled Egyptians right across Israel’s Southern border. Over 90,000 killed in Syria’s civil war across Israel’s North-East border. Iran’s nuclear program developing within shooting distance. Nowhere to run. Nowhere to hide…Fear, anxiety, panic. EEMA’LE! However, in response to international pressure, the police chose not to kill Rebbe Yosef Yitzchak, but rather decided to sentence him instead to 10 years of exile under brutal and life-threatening conditions in the Soviet Far East. But in the end, as a result of unrelenting international pressure, the Soviet authorities chose to free Rebbe Yosef Yitzchak only 2 weeks following his arrest. 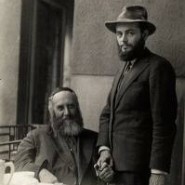 After his release, Rebbe Yosef Yitzchak and his devoted soon-to-be son-in-law, Rabbi Menachem Mendel Schneerson, continued to serve as religious leaders to the oppressed masses of Soviet Jewry– but their freedom and even their lives were in constant danger. In the newly-released Hebrew-language book “The Secret of the Rebbe” author Yechiel Harari writes, “On the way to one of their [illegal] meetings Rabbi Menachem Mendel noticed that his [father-in-law, the] Rebbe did not display any fear or anxiety, even though simply driving to their meeting placed them in great danger. He asked his Rebbe how he overcame his fears. Harrari continues, “From that point onwards, these words became guidelines for life from his Rebbe. Rabbi Menachem Mendel’s ability to focus totally on one single thing, and the ability to experience the constant heartbeat of creation in every single moment and moment, became the goal of his life. “He was completely and totally involved in every thing he did. When he became the Rebbe, the primary experience that every person who met him would express was that he felt that Rebbe Menachem Mendel was completely focused on him and on the matters that he brought up. Worry. Fear. Anxiety. The antidote? Such an important message! Thank you again. “That toy works for those with one world and many gods. I have one G-d and two worlds.” (not exact translation). He trusted Hashem so completely and knew that whatever would happen would be controlled by Hashem. I love the picture you have at the top? Can you label who is sitting and who is standing? Just a little correction – the Previous Rebbe was supposed to be sentenced to 10 years forced labor in Siberia, then it was changed to 3 years exile in Costrama and after only two weeks exiled, he was completely released.